Turn your travel time into YOU time! It’s September. Where are your kids? Are they in school? Have they gotten to school, yet? Are they in sports? Do you need to get them to practice? What about dinner? What are you going to do? Do you need to pick something up? Pioneer’s new Digital Media Receiver. Pioneer’s new Digital Media Receiver is a great way to turn your vehicle into your private, hidden-away-from-the-world, I’m-doing-what-I-want-until-I-get-there pod of self-indulgence. Turn your travel time into YOU time. Tune out with your tunes. MIXTRAX creates a nonstop mix of your music library complete with a range of DJ-inspired effects. MIXTRAX delivers a unique DJ infused listening experience to you in your car. MIXTRAX takes the music from an iPhone, iPod, USB device, or certain Android devices and plays it back with added transitions and effects, creating a virtual DJ inside the Pioneer receiver. Accept a call, or don’t – safely. Hands-free calling, wireless audio streaming, simple pairing, and voice recognition, Bluetooth wireless technology will keep you in your pod of self-indulgence, yet allow you to be productive – if you want. The new Pioneer Digital Media Receivers with Bluetooth wireless technology can use the voice recognition engine from your smartphone. This feature is compatible with iOS devices that have voice recognition capability. iPhone 4s or later users can take advantage of Siri Eyes Free functionality with a touch of a button. When activated, Siri voice prompts play through your vehicle’s speakers and your commands and questions are received and transmitted to the receiver using the external microphone. Siri Eyes Free provides access to many iPhone functions such as music selection; making phone calls; and listening to text message, calendar information, and reminders. You can even listen to Pandora in your vehicle! This personalized internet radio is designed to help you discover new music that you’ll love mixed in with music that you already know. With the MVH-X380BT, you can enjoy superior sound quality and full control of the Pandora experience in your car directly from the touchscreen display of the receiver. You can give tracks “thumbs up” or “thumbs down,” bookmark a song so you can purchase it later, easily switch between your personalized radio stations, and view full track data. You can’t change that it’s September and the craziness in your life has gone up a level. But you can take yourself away from it all once you slide into your ride. Keep your ride distraction-free. The experts at Auto One can make sure you get your very own pod of self-indulgence. 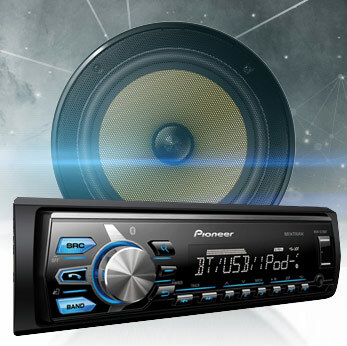 Ask the folks at Auto One about Pioneer’s Digital Media Receiver.